Click on this link if you need more information about Data Acquisition. 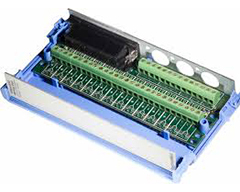 The iNET-600 Series A/D module provides 16SE/8DI voltage input channels (Ch#1...#16), each of which are independently software programmable with Windows software that support the direct connection to many common sensor types. Voltage input range on each channel is independently software programmable to one of: ±20 mV, ±40 mV, ±80 mV, ±150 mV, ±300 mV, ±600 mV, ±1.2V, ±2.5V, ±5V, ±10V. Included is a mating Hd44 Female Connector and Cover. Alternatively, one can attach iNET-600 Series to the following optional wiring boxes: iNET-500, iNET-511, iNET-512. If one is working with thermocouples, an iNET-510 wiring box is required due to its internal cold junction compensation. iNET-600 Series is a stand-alone USB data acquisition system. No additional components, such as external power supply, are required. Included in the box: iNET-600 Series Hardware Device, USB Cable, Software on CD, Mating Hd44 Female Connector and Hd44 Cover. Digitize at a maximum sample rate of 160K sample/sec for 1 channel, 16Ks/sec/ch for 2 channels, 8Ks/ sec/ch for 4 channels, and 4Ks/sec/ch for 8 channels. Maximum sample rate is for ±5V input signal. For accuracy and sample rate details on all supported input signals, see the tables at the end of the spec sheet. Each channel provides the following software programmable parameters: A/D Signal-Averaging-Per-Point (0 ... 100 mSec), Sample-Rate (samples-per-second-per-channel), Digital IIR Filter (Low Pass, High Pass, Band Pass, or Band Stop), Voltage Measurement Range (±20 mV to ±10V), Sensor Type, and Single-Ended or Differential Wiring. Excitation power (+3.3V ±0.2V, <80 mA, 28 mA per sensor max) is provided for sensors, along with other End User Power voltages. This 3.3V, which is referenced to instruNet Ground, is automatically read back by A/D when calculating sensor values. 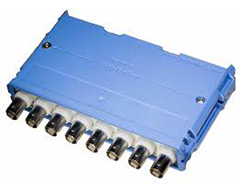 The 4 mA sink/source digital I/O port consists of 4 individual TTLcompatible lines (Ch#25...#28), each of which can be configured as: input or output bit. When configured as an input, a channel can be used to sense a digital high (2 to 5.5V) or digital low (0V to 0.8V). When configured as an output, a channel can be set high (e.g. >2V) or low (e.g. <0.8V). 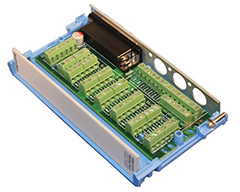 These I/O pins are short-circuit protected against high voltages up to 6.0V and down to -6.0V. One can easily set up sensors with the Quick Setup dialog box. iNET-510, iNET-511, iNET-512 wiring boxes easily bolt to iNET-600 Series devices. The iNET-510 is the simplest, is the lowest cost, and supports thermocouples. The iNET-511 includes 8 BNC connectors. The iNET-512 has a vRef/2 source that is used to help complete ¼ bridge and ½ bridge strain gage circuits. If you are measuring thermocouples, then the iNET-510 is the only wiring box that will work, since it contains an internal temperature sensor that measures the temperature of the iNET-510 screw terminals. 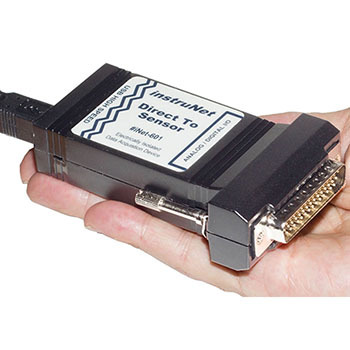 Note: iNET-600 and iNET-601 USB data acquisition modules come complete with USB interface cable, instruNet World software on CD, mating Hd44 female connector, hardware kit and Hd44 cover.